Homes in Argentina are priced in U.S. dollars even though buyers can only take out mortgages in pesos, the world’s worst performing currency against the greenback. And that’s only where the pain begins. Argentina’s once thriving housing market -- an example of its pro-business turnaround under President Mauricio Macri -- has fallen victim to both the peso’s 50 per cent plunge this year and soaring interest rates which exposed a convoluted property-buying process. Decades of economic booms and busts gave rise to a housing market priced in dollars, which means financing a purchase in pesos is now out of reach for many. Nationwide, the value of mortgages sold was down 75 per cent to 3.36 billion pesos (US$92 million) in September compared to April, central bank data shows. In the capital city of Buenos Aires, the number of homes bought with a mortgage dropped to 639 in August from a peak of 2,200 in April, according to a city organization that tracks data. The city’s real estate slowdown has become broad-based. Total homes sales -- with or without a mortgage -- also dropped 42 per cent in August from a peak last December. "The phone just stopped ringing," said Marcia Williamson, a real estate agent at Gateway to South America in Buenos Aires, who says she went from getting about 60 calls a week to 10 at best. "When Argentina gets into uncertain times, people don’t sell and people don’t buy." 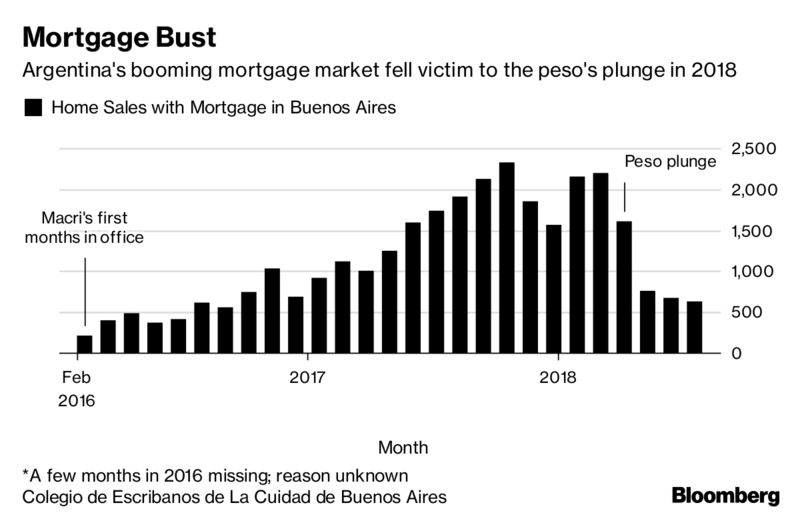 Argentina’s mortgage market collapse is one of the many consequences the economy faces this year from a currency crisis spurred by policy missteps, a drought and growing deficits that spooked investors, eventually prompting the government to commit to austerity in a deal with the International Monetary Fund. For Argentines like Sergio Traetta, this all came as he was looking to buy his first home. The 34-year old salesman at a construction firm was set on moving out of his rental apartment in Avellaneda, a working class suburb south of Buenos Aires. Traetta and his wife Laurena looked for homes priced between US$80,000 to US$100,000 which would need to be paid in greenback. With a joint annual income of 1,080,000 pesos (US$29,230), they had no option other than getting a mortgage denominated in the country’s rapidly weakening currency. After Macri took office in 2015, he slashed regulations in an attempt to create a generation of first-time homeowners. Meanwhile, to help protect banks from runaway inflation, the government allows them to adjust monthly payments on floating rate mortgages. On top of the adjusted amount each month, there’s also interest. Some like Traetta have sought fixed-rate mortgages to avoid inflation-adjusted payments. Even then, the best rate he was offered was 19 percent for the entirety of the 20-year mortgage, an amount that he said was prohibitively high. "You end up paying four times, five times the value of the property," Traetta said. The dollar-denominated real estate market "is a cultural problem. After so many crises, we know the peso is going to go down." At the same time, taking out mortgages in dollars is off limits for the vast majority of Argentines. The central bank largely outlawed that practice in 2002 after the country defaulted. Only citizens that earn dollars, such as exporters, may take out dollar loans. Macri is trying to shield home buyers from some of the pain. His administration recently implemented caps on monthly mortgage payments, and the government is trying to make it easier for buyers waiting on the sidelines to rent in the meantime. For Maria Castiglioni, an economist at consultancy C&T Asesores in Buenos Aires, there’s still no light at the end of the tunnel. The housing market’s recovery "depends on whether the macroeconomic situation stabilizes," she said. "The economic uncertainty right now makes a lot of people not want to take on this debt."